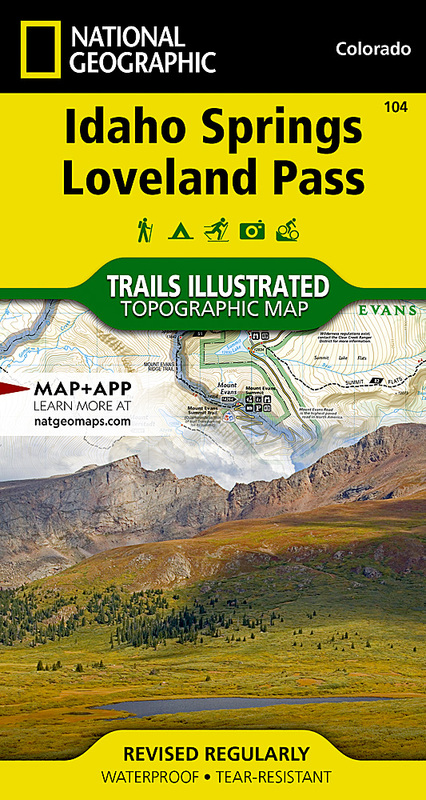 Expertly researched and created in partnership with local land management agencies, National Geographic's Trails Illustrated map of Idaho Springs, Loveland Pass provides an unparalleled tool for exploring this scenic region. Whatever the season, you'll find this map handy for pursuing a host of recreational activities from skiing and snowmobiling to hiking and camping. This map features many key points of interest including Arapaho, White River, and Pike national forests; Echo Lake; Mount Evans Wilderness; Guanella Pass Scenic Byway; and the Keystone, Loveland, and Arapahoe Basin ski areas. With miles of trails including Grays Peak National Recreation Trail and portions of the Colorado and Continental Divide trails, this map can guide you off the beaten path and back again. Hiking, equestrian, bike, snowmobile, and ski trails are clearly marked, as well as a variety of recreational features including fishing areas, trailheads, campgrounds, and picnic areas. The map base includes contour lines and elevations for summits, passes and many lakes. Other features found on this map include: Arapaho National Forest, Chief Mountain, Front Range, Ganley Mountain, Grays Peak, Loveland Pass, Mount Bierstadt, Mount Evans, Mount Evans Wilderness, Pike National Forest, Torreys Peak, White River National Forest.